After the sun goes down, the first few minutes of evening present a special photographic opportunity. Outdoor photographers often use the terms “magic light” and “golden hour” to denote the special light when the sun is low in the sky and nearing the horizon — resulting in intense yellow and orange colors and providing a low directional spotlight that skims across the landscape, sculpting and defining the shape and texture of illuminated objects. A serious photographer may even sit in one location for several hours waiting for that magic light, which typically begins to occur about one hour before sunset and lasts until sunset itself. In reality, the best magic light or golden “hour” may offer a window of only five to 10 minutes in which the magnificent evening light has its most artistic and visceral impact. Oftentimes, photographers will take that last image just as the sun disappears on the horizon and then pack up the camera bag and head home. If they do that, they will miss a special opportunity that is only then beginning to present itself: The Blue Hour. 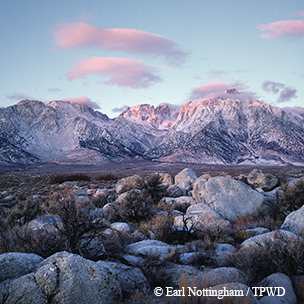 In a Blue Hour moment, the warm colors of the clouds and mountaintops contrast with the cool colors of the sky at dusk in the Alabama Hills of California. The evening Blue Hour begins roughly 10 to 15 minutes after sunset, or when the sun dips approximately 6 degrees below the horizon. This is the period of civil twilight in which the sky begins to take on a rich blue hue that gradually darkens as astronomical twilight comes on, eventually turning to the black night sky. The early minutes of Blue Hour are often great times to capture high clouds or mountaintops that still have some sunlight illuminating them, creating the visual vibrancy of warm colors against the cooler sky. It is also a prime time to photograph a rising full moon. The later minutes of Blue Hour provide the best scenario for photographing city lights against the sky. Again, there is a small window of opportunity of only five to 10 minutes in which the deep blue sky provides the optimum background for the luminance of street, building and vehicle lights. For those photographers who enjoy using hand-held lights to paint buildings or other subjects with light, this is a great time to make the exposure. 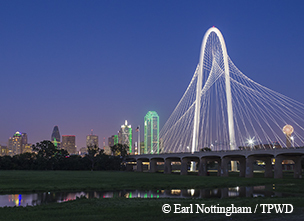 In the later minutes of the Blue Hour, the deep blue sky provides a dramatic backdrop for the skyline and the Margaret Hunt Hill Bridge in Dallas. Blue Hour demands some special considerations in order to get the best possible photograph. By the nature of the time, light levels are very low, which immediately indicates that a sturdy tripod is a must. Exposures can easily go up to a few seconds, so hand-holding is not an option. Try to eliminate any camera motion by using an electronic cable release or using the camera’s timer to avoid any hand-to-camera contact. Take advantage of your camera’s higher ISO settings to gather more light, enabling faster shutter speeds. Be careful to not use such a high ISO that unflattering digital noise begins to show up in the images. Assuming you are on a tripod, an ISO range of 100-400 should be more than enough. If you are shooting only a JPG file (not RAW), try to avoid the Auto White Balance (AWB) setting and opt instead for the Daylight or Tungsten color balance. This will help ensure that your blue sky is rendered a deep blue. Finally, for planning a shoot, consider using a smartphone app that provides sunset, sunrise and twilight times as well as information on celestial events. The amazing sensitivity of current digital cameras opens up low-light shooting opportunities that previously didn’t exist or were very difficult (and expensive) to obtain. So whatever you do, don’t quit shooting at sunset. The party’s just starting!